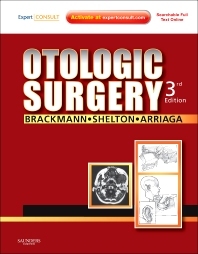 Otologic Surgery—the third edition of this invaluable surgical reference—has been thoroughly updated to reflect the latest advances in the field and covers all aspects of surgery of the ear and skull base. Derald E. Brackmann, MD, Clough Shelton, MD, and Moises A. Arriaga, MD bring you seven new chapters on the hot topics of Cartilage Tympanoplasty, Reversible Canal Wall Down Mastiodectomy, Superior Semicircular Canal Dehiscence Syndrome, Endoscopic Skull Base Surgery, Far Lateral Transcondylar Approach, Stereotactic Radiation Therapy, and Vascular Considerations in Neurotology. These extensive updates, along with the inclusion of new contributors and the elimination of redundant chapters, ensure that this book provides you with the essential information you need to choose and perform state-of-the-art surgical techniques. The companion web site at expertconsult.com features the fully searchable text, as well as a video library and question and answer section. Discusses controversies and alternate approaches so you can make a well-informed decision from the full range of choices. Presents the expertise and insights from more than 50 leading specialists to provide you with authoritative advice on surgical problems. Provides detailed visual guidance on how to perform procedures through step-by-step illustrations.